SCP-4075-a, far left, at their native colony. Rio Maximo Wildlife Reserve, Cuba. Special Containment Procedures: SCP-4075-1 has been purchased by the Foundation. The site has been secured to prevent civilian entry; fences have been erected around the perimeter, with signs warning against entry on account of ongoing renovation. Attempts to track anomalous movement of SCP-4075 members are ongoing. If large scale anomalous activity occurs, similar to that observed in Addendum 4075.04, cover stories of irregular colony movements are to be disseminated, with any contradictory media or online coverage suppressed. Description: SCP-4075 is a flamingo colony located in an abandoned office block, designated SCP-4075-1, in Lima, Peru. All known species of flamingos are present in the colony, in proportions roughly aligned to global species demographics. At any time, there are approximately 500 members of SCP-4075 present within SCP-4075-1. While situated within SCP-4075-1, members of SCP-4075 gain anomalous properties, most notably the ability to communicate verbally with humans. Speech will be heard in the language the listener is most familiar with. Members of SCP-4075 have the ability to instantaneously teleport to other, non-anomalous flamingo colonies situated around the world, and then back to SCP-4075-1. Members have been observed teleporting to other colonies for the purposes of sleep, sustenance, and mating. Travel between colonies and SCP-4075-1 also appears to serve the purpose of SCP-4075-2 collection. In the majority of instances of teleportation to SCP-4075-1, members will be carrying paper documents within their beaks. Foundation Agents Marquetti and Peralta were dispatched to SCP-4075-1 after local reports of anomalous activity within SCP-4075. Agents entered the site through a reception area on the ground floor, where 6 instances of SCP-4075 were stationed behind office desks. Upon observing members of SCP-4075 communicating with human speech, agents requested permission to approach from command. Request was granted. 5 instances ignored agents and did not respond to attempts to initiate conversation. The sixth instance, an American Flamingo3 henceforth designated SCP-4075-a, engaged with agents. Agents approach SCP-4075-a, which is applying a rubber stamp held in its mouth to documents on the desk in front of it. As agents approach, SCP-4075-a places down the stamp and faces agents. SCP-4075-a: Oh man, here comes another. We've had 3 or 4 of your lot come through here already this month. What do you want? SCP-4075-a: Your form. If you want an interview you need a form. Agent Marquetti turns to look at Agent Peralta. SCP-4075-a: *sighs* Third floor. Ask for Employee N38795DD. Or just ask for Clarence. Agent Peralta: I'd just like to ask you some questions on why you're here…and how we're communicating right now. SCP-4075-a: Look, I can't talk to you if you don't have a form. No form, no talking. I didn't make them, but they're the rules. If we keep talking I'm going to be sent to a behavioural tribunal, and I do not have time for that this year. Address details for the last 8 years, 7 months, and 2 weeks. If the requester had ever contracted Avian influenza. If the requester has knowingly had contact with an individual affected with Avian influenza. Scans of three identification documents. Acceptable examples listed included birth certificate, death certificate, passport, driver's license (if issued in the last 6 months), social security card, or amateur radio license. Agents were also asked to complete an "External Party - Consent for Processing" form, in quadruplicate. Liaising with command, agents Marquetti and Peralta completed and submitted the forms. They were informed the processing of said forms would take between 5 and 75 working days, not including Tuesdays. Form responses were received on the 73rd day. Agent Marquetti's request was granted, and she was issued with an ID number. Agent Peralta had failed to account for his address for 2 days in the period details were asked for. His request was denied, although he was provided with a new blank form. As SCP-4075-a had previously engaged with agents, it was decided to arrange an interview with this instance. Agent Marquetti arranged to interview SCP-4075-a, through another form, "External Party - Event Scheduling - Face to Face Bidirectional Communication Request - Interview (Interviewer)". It is understood that SCP-4075-a completed a form entitled "External Party - Event Scheduling - Face to Face Bidirectional Communication Request - Interview (Interviewee)". Agent Marquetti was granted permission to ask SCP-4075-a no more than 4 questions. By the date of the interview, Agent Peralti had been issued with an ID number. He was able to observe the interview, but not partake. Interview took place on the ground floor of SCP-4075-1. Agent Marquetti: Morning Employee G9898CX, are you still available for our interview? SCP-4075-a: Yep, now's good for me - and that's question 1 out the way. Let's keep this quick, I've got a backlog of verification requests the size of my wingspan. Agent Marquetti curses under her breath, and crosses out a question on her interview log. Agent Marquetti: Not the start I was hoping for, but thank you nonetheless. To begin, please could you explain what you and your…flock are doing here? SCP-4075-a: I don't know the exact details, never had to ask. We've been about for a while, but things started to be formalised when your kind turned up in this part of the world, and we had to leave North America. There needed to be some form of organisation to make sure they all got down here together. Since then we've been helping govern colonies all over. You'd need to speak to the Historical Matters and Record of Records department if you wanted to know more. Agent Marquetti: What's your role here? SCP-4075-a: Our first major job might have been Immigration, but we've expanded a lot since then. I'm in Verification - I get the documents, I check the documents, I pass them on to Re-Verification who checks them again. I don't know where they go after there - again, I've never had to ask. We process a lot of stuff, but the majority are birth certificates, death certificates, requests for immigration or seasonal migration. Those requests almost always get denied, the colony up at Carmague is one of the only ones that consistently gets their paper work in order. Mating season is our busiest time though, without a doubt. You've got to stick in a request for courting, a request to couple up if said-courting is successful, a notification of pregnancy document not long after that. It's a lot of work, but it's just the way it is. Those forms aren't too bad, to complete or process. It's the recoupling request which is a pain. Every year we'll get an influx of requests from wandering males or unhappy females asking to couple up with a new mate. And every year, we have to turn a whole lot down because they've made an error in the forms, or don't meet the criteria. It can be weeks on end before I return to my colony. And after mating season we've got all the birth certificates to issue, making sure all the newborns are correctly assigned to the right colony…we like keeping track of our own I guess. Agent Marquetti scribbles on the corner of her clipboard. Agent Marquetti: Sorry, my pen seems to have stopped working. (Agent Marquetti turns to Agent Peralta.) Do you have a spare I could borrow? Agent Marquetti: No, no, no, please, that wasn't a question for you! What I would like to ask is, well, I'm struggling to understand why you're all here in the first place. Why you're here doing what you're doing. What's the point of all this? SCP-4075-a: I'm not sure on that I'm afraid. Even if I did, you don't have the security clearance, and I'm not getting involved with Avian Resources again. Accidentally marked a document as correct once, ended up in a disciplinary hearing. A 30-bird jury had to unanimously decide the outcome. Whole thing ended in a stalemate. They found me culpable, but couldn't decide on an 80 or 81 day period of isolation. Took over 5 years start to finish…. Agent Marquetti: And do you know how it is we're having this conversation right now? None of your species in the wild have demonstrated half of the behaviours you demonstrate whilst within this building. SCP-4075-a: Again, I've got no idea. And that's your four. I need to validate a stack of Colouration Certificates due to be issued to some chicks in a colony in Senegal. Happy to talk again, just make sure you go through the proper channels. And just an FYI, you'll need a different form as it'll be the second time we meet. During the entirety of my time researching SCP-4075 I, nor any other member of the team, have yet to gain any useful information from them regarding the nature of their anomalous properties, and do not currently see any way in which I could gain useful information from them regarding anything. Whilst I could at first understand my assignment, due to my acquisition of credentials, we have failed to gain any valuable details not gathered through our initial interviews with instances of the anomaly. Subsequent interviews and research have failed to gather any information useful to my team, the Foundation, or the world at large. Documentation processed by SCP-4075 is wholly concerned with the regulation of the most mundane activity, and their reluctance to allow us to examine these documents severely limits our ability to establish causation. I have had no success in deriving any idea of SCP-4075's hierarchy, and which instances, if any, are responsible for the overall functioning of SCP-4075 and the setting of its objectives. Instances seem to fulfill their responsibilities purely for the sake of doing so. It is my personal belief that their actions serve no purpose. The irony of having to submit this form to escape from their forms is not lost on me. My only relief is that I've not had to provide a blood sample from my great-great-great-grandfather's second cousin once removed, or some other tripe that the birds would ask for. My skills and talents are sorely wasted on this assignment, and I see no reason not to move away from research to sole containment. If I have to brush another pink feather off my uniform I may just have to request reassignment to D-class duties. 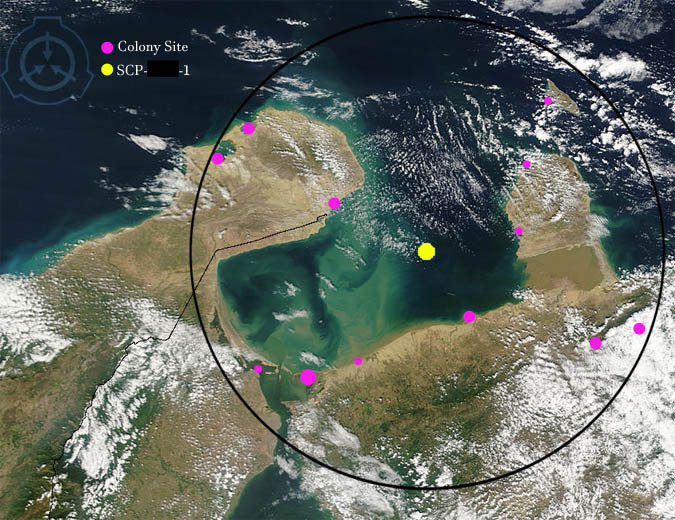 Locations of the largest missing colonies, and SCP-████-1. Click to enlarge. On 18/09/████ flamingo colonies in Northwest Venezuela / Northeast Colombia vanished with no explanation, including a large colony of 9,000 birds at La Ciénaga de Los Olivitos, Venezuela. In the days preceding, SCP-4075 had undergone a significant increase in activity. Attempts to discuss the disappearance were rebuked on the basis that Foundation personnel did not have the correct security clearance. The disappearance was localised to a 200km radius around the location now designated as SCP-████-1, the epicentre of SCP-████'s activity, which began on 21/09/████. The connection between these events was not made until after SCP-████'s neutralisation, following its activity escalating to a potential XK-Class scenario on 25/09/████. At the peak of SCP-████'s activity, the entire population of SCP-4075, along with the entire population of flamingos worldwide, also vanished, returning on SCP-████'s neutralisation. Agent Marquetti's request for reassignment was denied. SCP-4075 divulged no information surrounding these events, despite repeated attempts at questioning by Foundation agents4. Due to this, and the potential value of utilising SCP-4075 as an early warning system, a decision was taken to obtain information by force. A task team, led by Agent Marquetti and Peralta, entered SCP-4075-1 on 01/11/████, and attempted to obtain members of SCP-4075 and instances of SCP-4075-2 for further study at Foundation facilities. The operation was unsuccessful. SCP-4075 members demonstrated the ability to teleport around the office to avoid both Foundation operatives and projectiles. Operatives were able to obtain instances of SCP-4075-2, but discovered that these vanished when attempts were made to remove them from SCP-4075-1. Five minutes into the operation all Foundation operatives were teleported by unknown methods to the exterior of SCP-4075-1 and found themselves unable to re-enter. During the operation Agent Peralta was able to examine instances of SCP-4075-2, and reported a type of document he had not seen in previous excursions - an "Extra-Universal Evacuation Order". Attempts are currently underway to contact SCP-4075 members whilst they visit other colonies. Attempts to interview non-anomalous flamingos on the topic of SCP-4075 have been unsuccessful. On 21/12/████ Agent Marquetti failed to attend roll-call and was uncontactable. Due to her previous reassignment request, desertion was initially considered as a possible scenario, until her quarters were searched. None of Agent Marquetti's belongings had been removed, and no sign of a struggle was found. "Involuntary Tribunal Summons - Alina Marquetti, 21/12/████." 1. See Incident Report 4075.01. 2. See Incident Report 4075.01. 4. Most attempts were ignored outright. SCP-4075-a commented that the colony's annual leave requests had "finally" been approved. The comment is believed to be humorous in nature.